Some restaurants are just perfect for lazy mornings; indeed, people search far and wide for friendly little breakfast places where they can read the newspaper over a plate of eggs and cup of coffee while hanging out with friends or family. 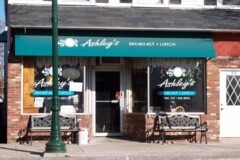 In the past, it seemed that nearly every town center had a place like Ashley's; a neighborhood restaurant that people could depend on day in and day out. With malls and shopping centers changing the landscape of the country, however, fewer and fewer of these places seem to exist. But Ashley's bucks this trend, and continues to thrive, for which people in this close-knit South Shore neighborhood should be thankful; Ashley's is indeed a vital part of the area, and one that many (including this writer) will continue to frequent on those slow, lazy Sunday mornings(BOSTON'S HIDDEN RESTAURANTS). Copyright 2010 Ashleys. All rights reserved.